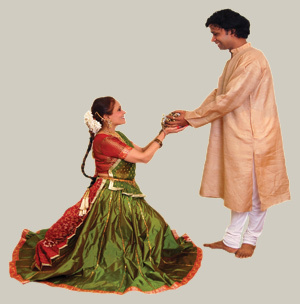 Beginner students : Introduction to Kathak, basic history, basic hand gestures, basic footwork. 1st year Diploma : Pure dance technique, set in 16 beat cycle, basic variation of footwork, hand gestures & how their used. 2nd year : focuses on more complicated grammar and technique of Kathak, Vandana, etc. 3rd year : focuses on complicated grammar of Kathak learn different rhythmic (taal) cycle and expressive items through Vandana, Bhajan and Gat Bhava. Post Diploma 1 : Vandana, Abhinay & students are geared towards more performing experience. Introduction to more rhythmic cycle. Post Diploma 2 : Advance students also get training instructing class emphasis is placed on stage presence, communication & musician audience, building stamina. Theory sessions are regularly given to develop insight into the dance. Rang Manch Pravesh (Graduation): Those students dedicated to the art and committed to mastering all aspects of Kathak will be offered the opportunity to complete a Rang Manch Pravesh. The Rang Manch Pravesh is most comparable to a graduation ceremony at which the student performs his/her first solo performance showcasing his/her full Kathak repertoire. It reflects a student’s transformation into a professional dancer capable of displaying the main aspects of Kathak and his/her Guru’s (teacher’s) teachings.